two nitrogen atoms at adjacent positions. Pyrazole is a prevalent scaffold in drug R&D and synthesis in particular bioactive compounds and reactions. 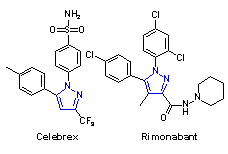 The pyrazole ring is present as the core in a variety of leading drugs such as Celebrex, Viagra and Rimonabant. They can also be used as bifunctional ligands for metal catalysis, and in various building blocks for pharmaceutical and agricultural research. Learn about how we are accelerating scientific and industrial development.